"Eleven-year-old Madison Mae and her younger brother, Albert, want to help save the family farm during troubled times. 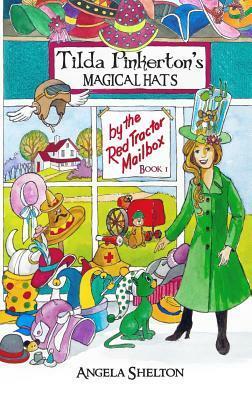 When a mysterious Magical Hat Shop appears by their grandpa's red tractor mailbox, the children meet Tilda Pinkerton who presents them with one-of-a-kind hats, causing new ideas and talents to suddenly burst forth. As a flood of harm comes rushing towards the farm, Tilda Pinkerton teaches the children how they can accomplish much more than anyone ever imagined." Like earlier stated I was given this book to read and review from the author/publisher for my unbiased and honest opinion. Though I am an adult and I have no kids of my own yet, there are little rugrats running around my life in many different ways (family, friends, and etc). When I first got the book in the mail, I opened it and left it on the counter at my parents. One of the little girls who my mom babysits seen it and begged to read it. I, being impressed that she so wanted to read it, allowed and encouraged her. In one sitting she read half of the book on her own. She is seven years old. She is an avid reader and barely had to ask about the big words. I asked her what she thought and she said, "I liked it! I want to read more! Can I have the sticker?" (a sticker came with the book). I was excited that she liked it! So it is approved by a 7 year old. Once she was done, I took the book and read it myself. It is a quick and simple read. However, it was simply adorable! I can this becoming a little kid show one day. Tilda Pinkerton reminds me a lot of Mary Poppins with her magical hats and cute cat. She teaches that imagination and creative is a good thing! Trying new things makes life unique! Also, it teaches about family and loving one another even though they may differ in opinions. Like Grandpa who is stuck in his ways and doesn't like new things. Good lessons for the young minds of today. The ending was cliffhanger-ish, so I expect to see more books following Tilda and her hats. Exciting! It was a nice ending, so the cliffhanger-ness didn't annoy me as much as it normally does. I also loved how she added a glossary of the big words she introduced. Very nice. Very clever of her. Along with that, at the end of every chapter she lists all the big words she used in that chapter, so the kids can then look up the words that were used. Very, very cool. Thanks for taking part in the tour. I'm so glad that the 7 year old and yourself loved it! I did as well! Hooray! People leaving comments makes you feel loved - people loving my book makes me feel loved! So very happy you left the book on the counter to get a 7 yr old perspective and that you loved it too. [b][color=green]BUY CHEAP TADACIP ONLINE WITHOUT A PRESCRIPTION[/color][/b]!